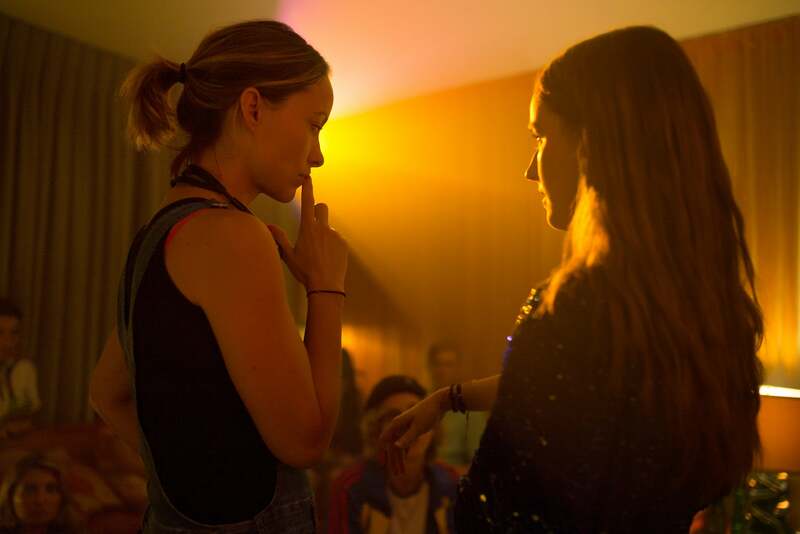 Olivia Wilde remains behind the camera, intently watching her Booksmart cast as they film one of the classroom scenes that kicks off her R-rated high school buddy comedy. Dressed in white overalls and a red T-shirt with her hair half-up half-down, the director could fit perfectly into the scene, but she is instead focused on her lights, camera angles and the dynamic team of actors she's assembled for her feature directorial debut. You wouldn't know this is Wilde's first time directing a movie, however, watching the way that she commands her set. Booksmart is the movie you wish you had in high school, a story of female friendship that, at the heart of it, transcends gender and teaches you about enjoying life to the fullest. The story follows BFFs Molly (Beanie Feldstein) and Amy (Kaitlyn Dever), two academic superstars who, on the eve of high school graduation, realize that they worked too hard and played too little. Determined not to fall short of their peers who partied all year long -- and still got accepted into prestigious universities -- the girls set out to cram four years of fun into one night. Chaos ensues. "It was important for me to a story about female friendship that focuses on how intimate these relationships are and how they're the most important at that age," Wilde tells a group of reporters, ET included, during a visit to the Santa Clarita, California, set in June. "And how it typically involves a necessary breakup, because at a certain point, you have to grow and evolve and that can be really traumatizing." "It's a story that is relatable in all ways to people of all ages," she says. "I just wanted to tell an authentic story about female friendship and create a buddy comedy about young women that I don't think I have seen before." Wilde worked her way up to directing Booksmart, earning her stripes behind the lens with a short film, Free Hugs, in 2011 and by helming music videos for Red Hot Chili Peppers ("Dark Necessities") and Edward Sharpe and the Magnetic Zeros ("No Love Like Yours"). Of course, she also has more than 15 years of acting experience, which helped her tune into her own cast. In addition to Feldstein and Dever, that cast is made up of young, up-and-coming stars like Billie Lourd, Noah Galvin, Skyler Gisondo and Molly Gordon, among others. "There are so many good people in this cast, that's why shooting a scene like this is so difficult, because we want every single person to have their moment on camera," Wilde explains during a break in filming. "As you can see, Noah Galvin is so incredible and Molly, Diana [Silvers] and all the girls are all so incredible, and today we wrapped Jessica Williams." The film's adult cast includes Wilde's partner, Jason Sudeikis, whom she compares directing to driving a Ferrari. "It does all the work on its own and in the right direction." She was also honored to cast comedy legends Lisa Kudrow and Will Forte. "I never met Lisa [before], but now I'd like to consider her a close personal friend," Wilde says. "It was super interesting talking to her about everything, about writing, about comedy, about women in film, about biology. She is brilliant. That was amazing and a huge honor for me, for all of us, really. The moment Lisa was traveling to set for the first time, everybody on set got really palm sweaty and quiet." "And then Forte is a really good friend of mine, and he’s awesome and so unselfconscious and funny and available and sweet," she continues. "They added a lot of heart and obviously a lot of comedy." As an actor herself, Wilde never understood why movie sets so often become "really stressful places that strangle creativity." "The vibe of the set starts at the top," she says. "So, I try -- even when it is stressful -- to just really maintain a level of calm." In fact, Wilde has done everything she can in order to create a set that is, in her words, "a really fertile environment to encourage the most creativity and to allow people to feel safe and relaxed enough to come up with their best ideas." "Having been an actor for a long time, I can empathize with them and help them through moments that are sometimes frustrating, whether it has to do with your eyeline or working under stressful circumstances," she says. "We made this movie in a very short amount of time, so the actors had to be extraordinarily prepared and working under the gun." "The other day we were shooting the end of the film, the close-ups of our two lead actresses which will end the film, and we were chasing the light because the sun was going down and we were like 'EVERYBODY MOVE!'" she recalls with a laugh. "It was total mayhem and they were so present and calm and prepared. I am in awe of them. Without their level of preparedness and professionalism, I wouldn't have been able to pull this off." It helps that Wilde is already her actors' biggest fan and sees the full potential of their talents. "I am excited about how many careers I think are launching here on this set," she enthuses. "When you think of Diana Silvers, who as far as I am concerned is the next Julia Roberts, she's 20 years old! She’s at the beginning of this incredible journey and it's really fun for me to throw her little bits and pieces of advice. Austin Crute, who I firmly believe will be a massive star. Noah Galvin, who has already achieved success and took over as Evan Hansen for Ben Platt, he's on his way. But I also love that we got to have him at this exciting beginning stage." Wilde takes a moment, then, to share the wisdom she's hoped to pass on to her actors. "If anything, I tried to set the example of just stay humble, stay hungry and treat people well," she says. "Because this business is based on relationships and taking care of one another. And in the end, we're just a bunch of gypsies telling stories and it's really about maintaining that sense of humility that only leads to better work." Booksmart opens in theaters on May 24. 'Booksmart' Red Band Trailer: Olivia Wilde's Directorial Debut!